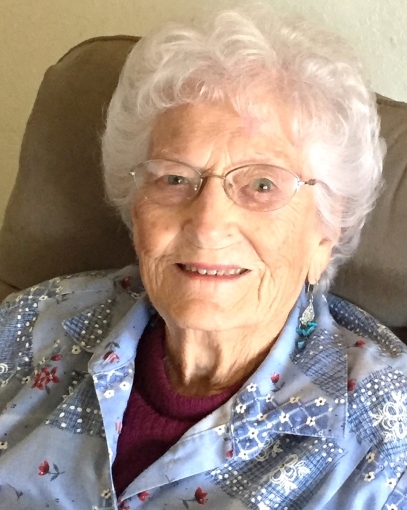 Donna Elizabeth (Price) Bay, age 98, our loving mother, grandmother, great-grandmother, aunt and friend, passed away peacefully on Tuesday, March 5, 2019, at home from natural causes. She was born April 20, 1920, to Sylvester J. Price and Inez Elizabeth (Osborn) Price and was a long-time resident of the Parma, Idaho area. She had two older brothers: Clarence Sylvester Price, and Charles Loren Price (who died before she was born). She graduated from Parma High School and attended the Weiser Institute for a short time. Donna lived near Parma her entire life except for a period of time when her parents moved to California and during World War II when her husband served in the Coast Guard in Bandon, Oregon. Donna married David Franklin Bay on July 29, 1942, and they raised 5 children on their farm located in Apple Valley near Parma. Donna worked as a bookkeeper at various jobs during her lifetime at Idaho Power, Bank of Bandon, Parma Water Lifter, Parma Furniture, and Stunz Fonda & Pratt Law Offices, where she retired at the age of 74. She was also a talented seamstress, making most of her kids’ clothes and teaching others how to sew. David and Donna enjoyed camping, hunting, fishing, boating, RVing and riding motorcycles. She also loved bowling on a league and playing bridge with her friends. Donna is survived by her son, Gary Bay (Michelle); her daughters, Brenda Fitzsimons, Trudy Spanier, and Deena Bay (Jaime Mackrill); 7 grandchildren, 6 great-grandchildren, and numerous nieces, nephews and cousins. She was preceded in death by her parents and brothers, her husband, David, and her youngest son, Kelly Bay. She was also preceded in death by her beloved sister-in-law, Betty Jane (Bay) Kepler who she always said was a sister to her. Donna demonstrated a positive attitude no matter what life threw at her, her perseverance to keep going and to do things for herself as much as she could, and her strong faith in God. Donna was grateful for every day and enjoyed life to the best of her ability. She loved playing bingo and having lunch with her friends at the Nyssa Senior Citizens’ Center. She missed all her friends at the Parma Kirkpatrick Memorial Community Church when she could no longer attend due to her infirmities, and loved when she had calls and visits from Pastor David Carlson and her friends. She had a special bond with her granddaughter, Destiny Spanier, and they spoke almost every day. She was especially grateful to Deena and Jaime for helping her daily so she could remain in her home. Special thanks to Mary Lou and Ray Davidson, Janice Trought, Karen Hensen, Kay Williams, Betty Kurtz, Paula and Daryl Weston, her friends at Nyssa Senior Center, and everyone who helped her in so many ways by their friendship, caring and thoughtful deeds. In lieu of flowers, suggested donations in her memory may be made to the Kirkpatrick Memorial Community Church, the Nyssa, Oregon Senior Citizens Center, Heart 2 Heart Ranch (25948 Vermont Street, Parma, ID 83660), St. Jude Children’s Hospital or a favorite charity.